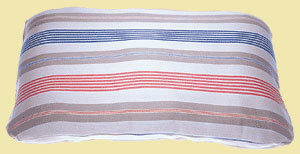 Classic stripy mattress ticking pattern in a pure cotton cover that unzips for easy laundering. Companion poly-fill mattress is also machine washable. 21″ long and 15″ wide.